DCMTL IS A MOVEMENT THAT IS REVITALIZING AN ENTIRE NEIGHBOURHOOD. DCMTL was created to put a spotlight on the dynamic companies and entrepreneurs in Central District, to help boost the area’s business profile and transform it into an entrepreneurial eco-system of innovation, creativity and discovery. It acts as the umbrella which encompasses several divisions. The concept of the DCMTL Startup Lab was created to help incubate and invest in the next generation of breakout leaders and startups, while also giving the Central District neighbourhood bigger space on the startup map. 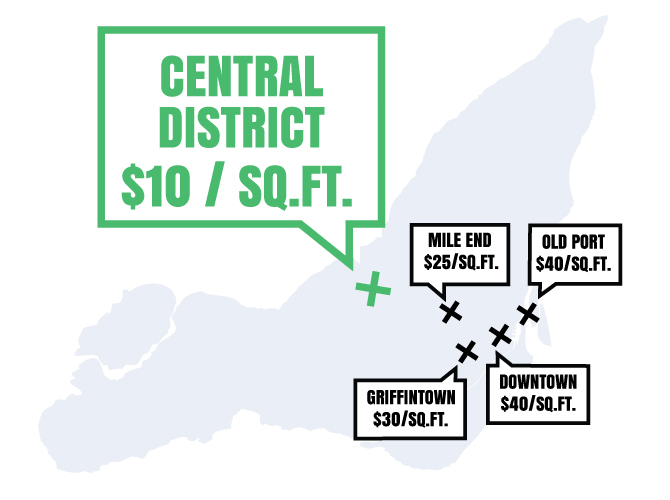 We believe that there is no better place in the city for an entrepreneur to grow than at the Central District. Montreal is a city of neighbourhoods to be enjoyed and discovered. Our online magazine, DCMTL Blog, aims to be the voice that keeps a virtual finger on the pulse of all that’s happening in the Central District hood and greater Montreal. Our blog strives to cultivate a community spirit and includes several services, such as workshops and networking events where like-minded business owners can gather and collectively share, learn and grow together in a positive and supportive atmosphere. DCMTL Blog is overseen by editor-in-chief, Virginie M. Savoie. Subscribe to our newsletter and receive latest DCMTL news delivered straight to your inbox. Previously known as Montreal’s most prominent Garment District, this iconic neighbourhood was the driving force of the local economy and the cornerstone of Montreal’s fashion industry from the ‘60s until the ‘90s. The former Chabanel area has been newly transformed. Today, it is a place in full growth and boasts a distinct culture full of vitality and creativity. Join us in celebrating the rebirth of this prosperous area, now renamed Central District. Central District has no shortage of inspirational and motivated entrepreneurs who have gathered in the neighbourhood to start their businesses; attracting tech, design, and apparel companies from around the city. Many of Montreal’s most successful businesses and fashion houses have made Central District their home. Join us in this thriving neighborhood that offers much potential and meets the growing demands of businesses who seek convenience and practicality.